We were approached by Harpers Farm Supplies when they were in the process of setting up a new retail outlet to supply products for the agricultural community. 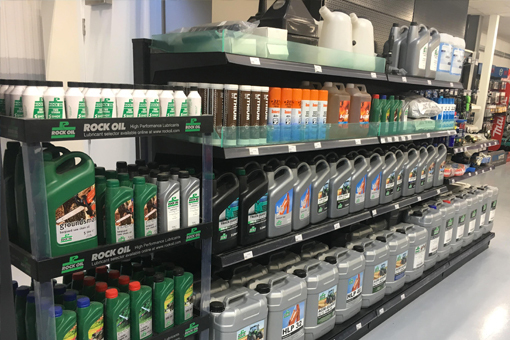 They were looking for a partner who would fully understand their vision for the new retail outlet and could offer tailored advice on oil, lubricants and other associated products for farming equipment. Using our knowledge of the agricultural industry and understanding the needs of the local farming community, we were able to recommended a brand of products that was not only suitable for the marketplace but also met the needs of the equipment that Harpers were supporting. Before the opening of the retail outlet, we hosting product training sessions and provided technical support to the Harpers team, and worked on the site to set up the retail display (including putting the shelves up). During opening week, a members of the Southern Lubricants team was in store every day to help with any additional product questions or concerns from customers. We also created flyers, organised prizes for an in-store raffle and created Harpers-branded ‘supplied by’ labels.